Orthopaedic surgeons in the United States perform over 100,000 ACL reconstructions every year. Since many of the patients who suffer these injuries want to return to competitive sports and demanding physical activities, surgery is often the desired treatment. In an ACL reconstruction, the surgeon makes a new ligament with an ACL graft – tissue from the patient or tissue from a donor. Many different graft options exist for ACL surgery. 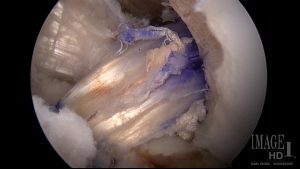 In this article, I briefly review the most common ACL graft choices for ACL surgery and the pros and cons of each one. An ACL reconstruction using a patellar tendon autograft involves the surgeon using the middle third of the patellar tendon with a small portion of the bone from the patella (kneecap) and from the tibia (shin bone). It has been the most common graft choice for high-level athletes for decades. Possible concerns with this graft include some patients noticing pain in the front of the knee in the months after surgery. They might complain of weakness with knee extension. People who kneel frequently, such as carpenters and mechanics, often complain of pain from direct contact with the donor site. An ACL reconstruction using hamstring tendon autograft involves the surgeon using one or two of the hamstring tendons on the medial (side closest to the midline) side of the knee. It is also a popular ACL graft choice. It is the most common option for reconstruction in skeletally immature children to minimize the risk of growth plate arrest. Among the possible concerns with hamstring autografts are discomfort in the back of the knee or thigh and weakness with knee flexion that some patients experience. 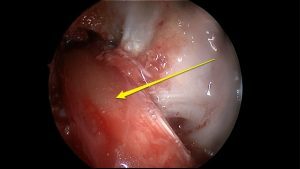 While this option is not as popular as patellar tendon or hamstring autografts, some surgeons harvest a portion of the quadriceps tendon above the patella with a small portion of bone from the top of the patella. Pain in the front of the knee and weakness with knee extension can result from this graft as well. reconstruction, but it is often used for revision surgeries in athletic people. Many patients feel uncomfortable violating the uninvolved knee, but it is an option to consider. An allograft is tissue from a donor or cadaver. Allografts use in ACL reconstruction has become a popular choice in recent years. Traditionally allografts have been used in revision surgeries and ACL reconstructions among older, less active people. In theory, patients might have less donor site pain since no graft was harvested from that knee. Concerns over increased costs, possibly higher rates of infection, and higher failure rates exist. Posterior tibial tendon, anterior tibial tendon, and hamstring tendons are some of the most common soft tissue allograft options. The same possible concerns and benefits exist with these allografts as with patellar tendon allografts. Choosing an appropriate graft for ACL reconstruction is one of the key decisions involved in these surgeries. Patients should discuss the options and the risks and benefits of each one with their orthopedic surgeons. A hamstring tendon has been used to reconstruct the ACL in this patient (runs from upper right to lower left). What does surgery and rehab of a tibial plateau fracture entail? Should an older patient use an allograft for ACL surgery?